​Chronic wasting disease (CWD) is a transmissible prion disease that results in neurodegeneration and eventual death. The detection of CWD in free-ranging white-tailed deer in 2015 challenges the foundation of wildlife conservation in Michigan. In states where the disease is established, CWD reduces the health of populations and causes long-term population decline. The discovery of CWD in Michigan creates an immediate need for research on local deer populations. Though there have been over 50 confirmed CWD cases in Michigan, the initial 9 cases occurred across a relatively small geographic region in Central Michigan. This presents us with a unique opportunity to study a disease that has recently emerged on the landscape. In other states where CWD is established, disease spread is attributed to deer movements. 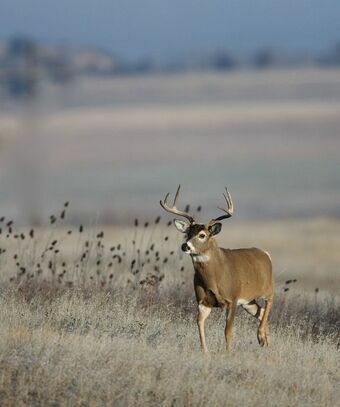 For this reason, our research aims to accumulate a dataset on movement behavior of deer that is of high temporal and spatial resolution to address questions about dispersal rates, directionality and distances, as well as evaluate hypotheses about environmental factors that are likely influences on dispersal behavior. This information will be critical for informing management strategies in real-time aimed at improving the health of our wildlife resources.